The middle-school years at St. Francis are fun, challenging and productive. There are many curricular and social activities that make these years memorable. Sixth graders have the exciting job of making the critical transition from elementary school to middle school. This means more independence, increased responsibilities, higher expectations, balancing school life with busy home schedules and dealing with those very special emotional, social, and physical changes that occur during these years. St. Francis School believes that the K-8 structure builds leadership, confidence and compassion in middle-school students. At the foundation is a commitment to growing in faith and love of God. They are actively involved in prayer, service, and liturgy. 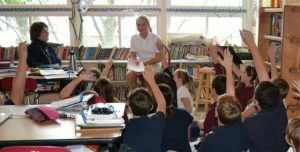 Our highly qualified and committed staff has many years of experience teaching 6th graders and are keenly aware of and sensitive to the unique needs of these students during these critical growth years. Textbook: Christ Our Life published by Loyola Press. The sixth-grade Religion program consists of Mass, personal and group prayer, regular worship through singing, numerous service opportunities and a curricular study of the Old Testament and salvation history. Because students are expected to live a Jesus-centered life at all times, faith and morality are integrated into every curricular subject! The sixth graders also participate in Second Step, a middle-school program teaching empathy, bullying prevention, emotion management, problem-solving and substance abuse prevention. Textbook: English by Houghton Mifflin and Write Source by Houghton Mifflin. As part of our writing workshop approach in English, grammar and mechanics mini-lessons are integrated into daily and long-term writing opportunities. Sixth graders also engage in integrated vocabulary study. Textbook: My Math published by McGraw-Hill. The sixth-grade math program includes a variety of learning experiences: math games, demonstrations, mental math, manipulative work, collaborative problem-solving, solving problems with calculators, lectures, practice, review, homework, tests and quizzes. The topics and concepts covered during the year include statistics, algebra, decimals, measurement, fractions, geometry, integers, ratio, proportion, percent and probability. ALEKS is used weekly to supplement the curriculum. Our 6th grade science curriculum is based on Project-Based Inquiry Science, a cutting-edge series designed to give students the skills and practice they need to think and act like authentic scientists. Each unit includes a big question or challenge related to a real-world problem in which students have to apply scientific skills to gather, organize and analyze data, use critical thinking, develop explanations and work collaboratively. They have opportunities to do the work of scientists: run experiments, design and build models, research, examine data sets, use technology and make presentations. In the process, they learn the scientific concepts and skills they need to answer the big questions and challenges. 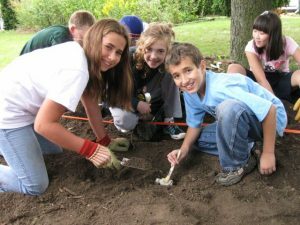 During the 6th grade, students are immersed in earth science. They begin the year with a launcher unit, Digging In, in which they acquire scientific skills within an earth science context. The other three geology units include Ever-Changing Earth, Astronomy and Weather Watch, which are published by It’s About Time. Textbook: Vocabulary Workshop, Levels A published by Sadlier-Oxford. The sixth-grade classrooms use the Sadlier-Oxford Vocabulary Workshop books, levels A. The fifteen (15) units in each book focus on definitions, context, synonyms and antonyms. The online component of this program includes an audio program and interactive games and puzzles. Textbook: Literature: Timeless Voices, Timeless Themes published by Prentice Hall, Inc. (Bronze Edition). Helping students develop and continue a love of reading is very important to our reading workshop approach, which includes authentic literature at its core. Daily mini-lessons focus on the transition from literal reading to critical reading. The teacher selects from a variety of techniques, which includes free-choice reading, Socratic circles, genre study, critical and creative thinking projects and readers’ theater. There is a literature-based Holocaust unit at the end of the year. Each spring, students study and perform a Shakespeare play. Whole-class books read during the year include The View from Saturday, Greek Gods, The Giver, Hiroshima, Daniel’s Story, and The Diary of Anne Frank. Textbook: The World published by Scott Foresman, Inc.
Sixth-grade students begin their year in social studies with a study of “culture,” participating in an archaeological simulation called “THE BIG DIG.” This initial activity kicks off a year of simulations, group work, projects, textbook study, field trips, artifact analysis, Internet tours and other challenges during the remaining units: Ancient Egypt, Ancient Greece, Ancient Rome, The Middle Ages and the Renaissance. A formal term paper is written in May, complete with note cards, an outline and citations. The year culminates with a world culture fair and Roman chariot races! Textbook: ¡Avancemos! published by Holt McDougal. ¡Bienvenidos al maravilloso mundo del espaῆol!– Welcome to the wonderful world of Spanish! Learning the Spanish language and Spanish culture is a journey that starts in the elementary grades at St. Francis of Assisi. Students in sixth grade will start the program with Level Book 1A, which covers an introduction to the language and culture, vocabulary, nouns, pronouns, various sentence structures, numbers and a few main verbs with their respective conjugation in the present tense. Our sixth graders participate weekly in art, band and physical education taught by our specials teachers. They visit the computer lab and library once a week with their homeroom teachers. Many field trips, guest speakers and service opportunities also make up an important part of our sixth-grade year. Service and leadership enrich the spirit. In addition to participating as altar servers and singing in the choir, sixth-grade students also perform other community services throughout the year. Examples of past service projects include: partnering with residents at long-term care facilities, picking invasive species at local parks, sorting and packaging food at Food Gatherers and serving meals at the Salvation Army.